One of my favorite Christmas traditions is reading short stories and poems each night before bed with my family. I decided to share two of my favorites. 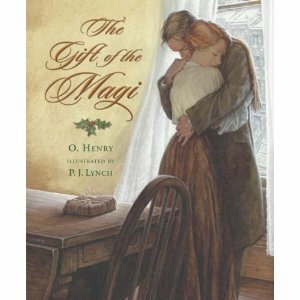 The first is the short story The Gift of the Magi by O. Henry, I have loved this story for as long as I can remember and I get excited each year when I get to read it! The second is a sweet little story, Teach the Children. I was given this story when I started having babies and instantly loved it! Just a week before Christmas I had a visitor. This is how it happened...I just finished the household chores for the night and was preparing to go to bed, when I heard a noise in the front of the house. I opened the door to the front room and to my surprise, Santa himself stepped out from behind the Christmas tree. He placed his finger over his mouth so I would not cry out. "What are you doing?" I started to ask. The words choked up in my throat, and I saw he had tears in his eyes. His usual jolly manner was gone. Gone was the eager, boisterous soul we all know. He then answered me with a simple statement. "TEACH THE CHILDREN!" I was puzzled; what did he mean? He anticipated my question, and with one quick movement brought forth a miniature toy bag from behind the tree. As I stood bewildered, Santa said, "Teach the children! Teach them the old meaning of Christmas. The meaning that now-a-days Christmas has forgotten." He then pulled from his bag and ornament of HIMSELF. "Teach the children that I, Santa Claus symbolize the generosity and good will we feel during the month of December." Next he pulled from his bag a GIFT and said, "Teach the children that God so loved the world that he gave..." "Thanks be to God for his unspeakable gift. Teach the children that the wise men bowed before the holy babe and presented him with gold, frankincense and myrrh. We should always give gifts in the same spirit of the wise men." Suddenly I heard a soft twinkling sound, and from his bag he pulled out a BELL. "Teach the children that as the lost sheep are found by the sound of the bell, it should ring mankind to the fold. The bell symbolizes guidance and return." That was so cool. Merry Christmas dears! I love The Gift of the Magi. It's one of my most favorite Christmas stories, and one of my most treasured memories. My grandpa used to read it to us each Christmas, along with The Little Match Girl. Loved it! Thanks for sharing! love, LOVE The Gift of the Magi. Awesome story. thanks for sharing!